Cityworks Design was lead author and designer for LA County Metro's new guide for improving customers' transfer experience. More than half of Metro riders transfer at least once during their trip. As the county’s transit network continues to expand and mobility patterns change, guidelines on how to plan and design good transfer experiences for riders are increasingly critical. 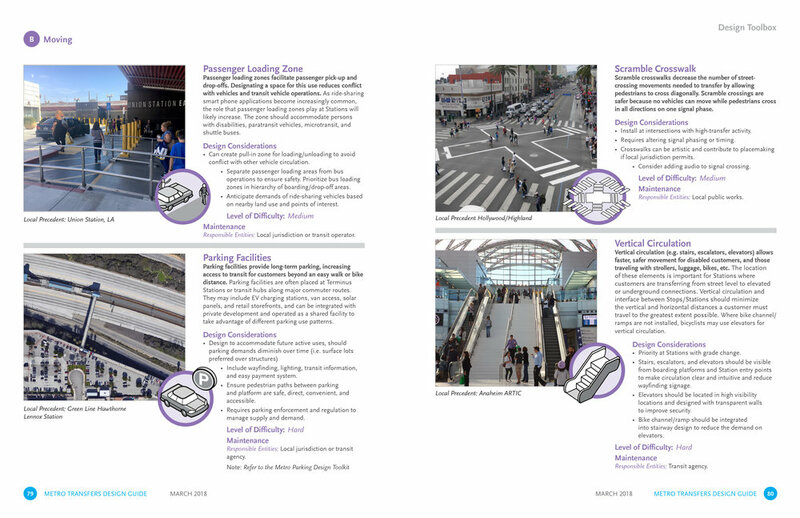 The guide includes a design checklist and toolbox to provide practical assistance to designers, public agencies, city staff and transit operators across LA County as they work to improve transit connections at new or existing stops and stations. With input from customer focus groups, stakeholders, advisory committees, and Metro staff, recommendations were organized around basic themes on how riders make decisions, move, and wait to board. Guiding principles include safety and security, accessibility, efficiency, clarity and comfort.